Stuart & Stuart are proud to present this traditional three-bedroom detached house with two reception rooms, vast private gardens, a double garage and a double driveway, promising a prime renovation project in popular Craigleith. Screened by manicured hedges on all sides, the house instantly endears with its classic bow window and twin chimneys. To the front are two reception rooms, both of which enjoy a favourable southwesterly aspect and a feature fireplace. The bow-windowed dining room would equally make an ideal family room or a fourth double bedroom, while the spacious living room leads into the kitchen to the rear. The space is furnished with fitted storage and a selection of freestanding appliances, as well as an original Belfast sink, two pantry cupboards and a traditional drying pulley. From here a back door allows access to a low maintenance rear garden. Also on the ground floor are a well proportioned double bedroom and an accessible shower room, which offers ample space for conversion into a three piece bathroom. The sunny first floor landing boasts a useful cupboard and two identical double bedrooms, both of which enjoy excellent proportions and south-facing dormer windows. The house benefits from double glazed windows throughout and gas central heating powered by an efficient Worcester Bosch conventional boiler. The enclosed and landscaped gardens comprise a southwest-facing lawn to the front and a neat patio to the rear, plus a greenhouse and a selection of mature shrubs and trees. 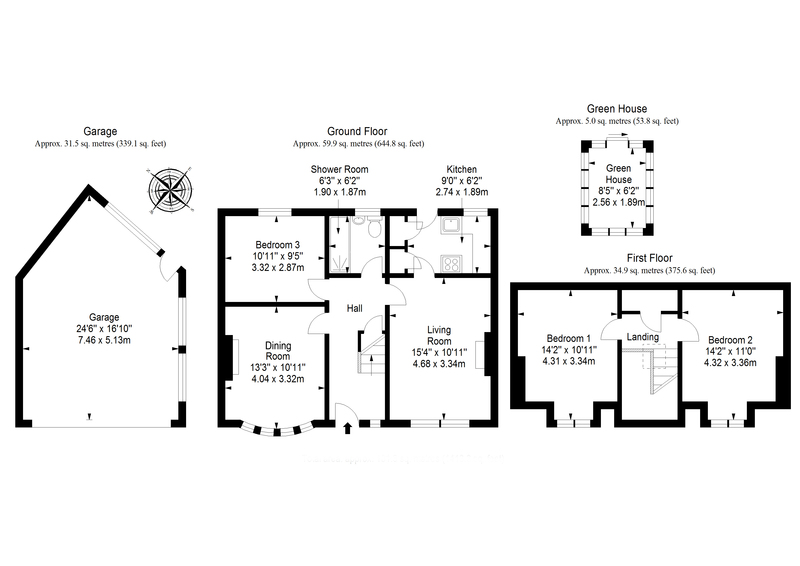 The substantial plot also accommodates a double garage with lighting and power, and a double driveway. To arrange a viewing, call 07557 988270. The professional service provided by Stuart and Stuart was first class throughout. I’m very grateful that you made it as stress free and as simple as possible. You were friendly, professional and got all the important bits done behind the scenes. Thank you and well done!